Yes, it’s finally here! The time of camp everyone has been waiting for: World Games! Last night we started the 2018 World Games–also the 30th anniversary–and you could feel the excitement and energy in the air! Everyone came down wearing their colour and with a red or blue glowstick in their hand, eagerly awaiting to find out what country they would be representing this year. We first saw the red team Captains and their Top Ten (their hardworking crew of helpers) perform a traditional dance filled with genies, lamps, and gold, and it was revealed to us that the team was Morocco, led by our Head of Dance Halle Purther and Head of Video Jordan Murley! We then went on over to the blue side, where a drawbridge on a castle opened, two knights stepped out, and the Top Ten did a traditional highland dance while wearing kilts. The knights took off their armour, and we found our captains of Scotland, Head of Canoe/Kayak Jess Whattam and longtime Manitou camper and counsellor Ben Simon! 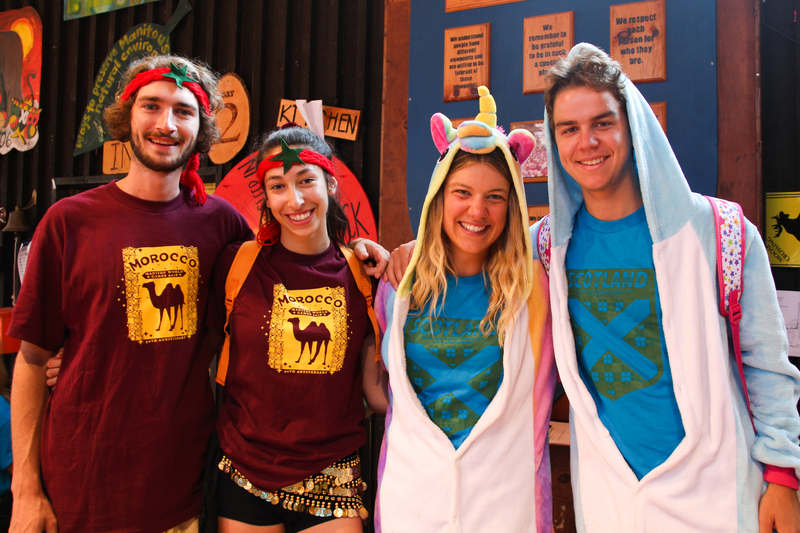 I have never seen the campers and staff so excited for their captains and countries, and I can tell already that it’s going to be a great World Games! The first day is already a packed one, and I will give you a little taste of what they have to come! To start off the day, our two teams will be working the whole morning on their Opening Ceremonies, a way to introduce to the judges and other team what their culture is and different parts of their country. I have seen some incredible Opening Ceremonies in the past, and I can’t wait to see the creativity of our teams, and learn more about these great countries. After that, our entire camp participates in a Track and Field event, where every Unit gets the chance to compete in events like Long Jump, Relay Race, Sprint, and even Shot put! It’s a great way to see our athletes in action and to cheer on the teams! And after our Track and Field event, our teams will go to their first Activity Block, a period of time where campers get to sign up for different activities, compete against the team, and have a blast, as well! There are things like Canoe Races, Painting Challenges, and even Trivia! We’ll then be off to one of the most highly anticipated events of World Games: the team dinners. Tonight we’ll be heading to Morocco, and though it’s a secret what they have in store, it’s bound to be breathtaking. But I’ll update you all on that tomorrow! And finally, to end off the day, we have our Fashion Show and Dance Off. Our Fashion Show is where campers have been making outfits throughout the day based on their teams, made out of their team t-shirts, and they strut down the catwalk to impress the judges. We end on a high note with our Dance Off, where our Captains, Top Ten, and Campers Captains lead their teams in wacky and crazy dances. Whoever the judges think got their team the most involved and dancing the hardest will win! It’s a fun ending to a great day, and I can’t wait for it all to start! Plus, there will be cheering throughout the day during meals, and I’m very excited to hear the creative chants the teams have come up with this year.